One of my goals for the coming season is to be a better planner. This is a little difficult for me, because I struggle with reconciling my dreams for the gardens with the realities of life. For example, I would love to turn the front lawn into an artful landscape, rather than have a bunch of boring grass. But one day we hope to sell our house and upgrade to dreamier diggs. We live in a typical suburban neighborhood where Scotts lawns are abundant. Removing the lawn could do serious damage to our home’s value. If I could sum up how I wish things were, I fall somewhere between wanting the whole property to be an English cottage garden, and wanting productive spaces for food crops. Since there is still a month or two before things begin to warm, I thought I would sit down and take a hard look at what I’ve got. 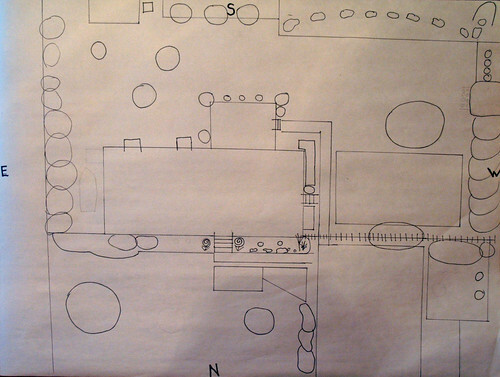 I created a basic layout of the property. And actually, I’m surprised at how much space is dedicated to gardens and living things. It’s a simple exercise, but it’s really forcing me to see the space for what it truly is. My next step is to consider what I want to grow, what I want to accomplish, and then figure out how those goals fit into the picture. For starters, I’m going to find ways to incorporate more food crops into ornamental gardens. Then I’m going to see what kinds of things should be moved or eliminated, like the roses. I struggle with them, but I really don’t have a good home for any of them, except the bush rose on the northwest corner of the house. Hopefully I’m on my way to better planning and less frustration!